Mixed or multiphase flows of solid/liquid or solid/gas are commonly found in many industrial fields, and their behavior is complex and difficult to predict in many cases. The use of computational fluid dynamics (CFD) has emerged as a powerful tool for the understanding of fluid mechanics in multiphase reactors, which are widely used in the chemical, petroleum, mining, food, beverage and pharmaceutical industries. 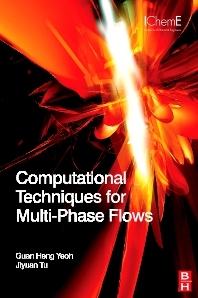 Computational Techniques for Multiphase Flows enables scientists and engineers to the undertand the basis and application of CFD in muliphase flow, explains how to use the technique, when to use it and how to interpret the results and apply them to improving aplications in process enginering and other multiphase application areas including the pumping, automotive and energy sectors. chemical and mechanical engineers, especially in filtration, separation, gas/ liquid pumping, aerospace, automotive and energy industries. Jiyuan Tu has 33 years of academic and industry experience in this field. He has authored 9 books, is an editor on 6 journals, has over 300 journal articles published and is in service of expert committee members to the United Nations (UN) and International Atomic Energy Agency (IAEA). In the last 10 years, he has won 6 awards for excellence in research and teaching. His areas of research and consulting expertise are: Computational fluid dynamics (CFD) and numerical heat transfer (NHT); computational and experimental modelling of multiphase flows; fluid-structure interaction; biomedical engineering: optimal design of drug delivery devices; prediction of aerosol deposition in human airways and nasal cavity; and simulation of blood flow in arteries.